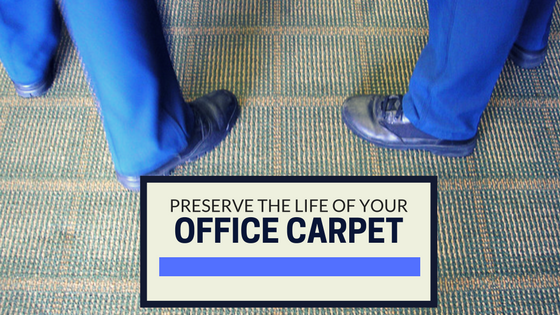 When office carpeting is poorly maintained, it can become dirty and make the office look unkempt overall. Dirt and debris collect in carpets, staining them and creating damage and wear over time. The way an office looks sets an impression about how professional the business is. Moreover, unclean carpeting is unhealthy for workers. In fact, according to Philip Tierno Jr., Ph.D., a microbiologist and immunologist at New York University Langone Medical Center and the author of The Secret Life of Germs: What They Are, Why We Need Them, and How We Can Protect Ourselves Against Them, wall-to-wall carpeting probably contains about 200,000 bacteria per square inch, making it 4,000 times dirtier than a toilet seat! Vacuuming on a regular basis helps manage these bacteria and their effects. TLC’s How Stuff Works recommends vacuuming once a week to prolong the life of a carpet. High traffic areas should be vacuumed more often to prevent a buildup of particles that can eventually cut the fibers of the carpeting. Vacuuming isn’t the best clean there can be. Dr. Charles Gerba, a professor of Environmental Microbiology at the University of Arizona, studied what shoes actually pick up and track inside. He identified microbial species that can cause intestinal, urinary, eye, lung, blood, and wound infections! Because a vacuum cleaner’s suction and rotating beater brush don’t usually reach the bottom of the carpet, germs such as E. coli, salmonella, staphylococcus stay inside the fibers. Additionally, what many businesses may not know is that almost all carpet companies require customers professionally steam clean their carpeting every 18 to 24 months in order to keep the carpet’s warranty valid. Protect the investment you’ve made in your business’ carpeting by hiring professionals to do the cleaning. *Tierno defines “fomite” as the technical name for a contaminated object that can transmit illness.